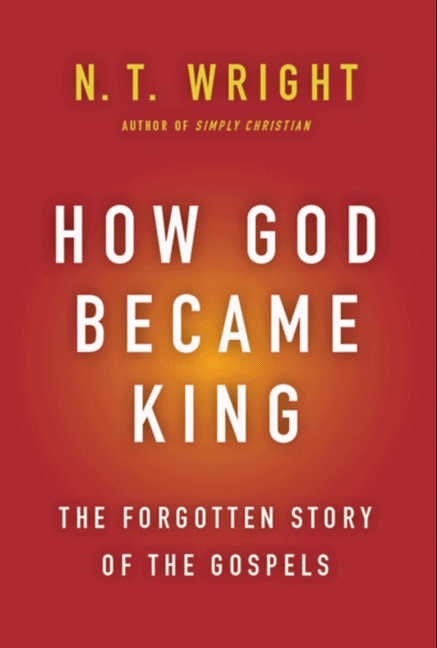 In his new book, How God Became King, N. T. Wright argues that the Christian tradition and various strands of the modern church have neglected the Gospels. This may sound like an outrageous claim, but Wright cites the church’s historic creeds as evidence. When “they refer to Jesus, [they] pass directly from his virgin birth to his suffering and death” (p. 11). So much detail, and yet nothing at all about what Jesus did in between being conceived and born, on the one hand, and being crucified under Pontius Pilate, on the other. Why not? If the aim were to summarize the key focal points of Christian faith, did that imply that that faith didn’t really need, shall we say, Matthew 3-26? Would chapters 1-2 (Jesus’ birth) and 27-28 (his death and resurrection) have done just as well? Was Matthew, and were Mark, Luke, and John for that matter, wasting time telling us all that stuff in the middle? Were they just giving us the “backstory” to satisfy any lingering curiosity the church might have about the earlier life of the one Christians now worshipped as Lord (p. 13)? Christians do much the same today. Evangelical Christians, for example, have an “atonement” theology that captures the transaction whereby people are reconciled to God (or, one version of it), and their understanding of Jesus begins and ends with whatever is relevant to informing that transaction. In 2003 I attended a conference where a well-known Christian leader from another continent requested some time with me. He had been reading my book Jesus and the Victory of God in the weeks before the conference and was intrigued by it. He wanted to know how it all made sense in terms of “the gospel” that he believed and taught. We had a cup of tea (some British and Anglican stereotypes don’t change) and talked for an hour or so. I tried to explain what I thought I was seeing: that the four gospels had, as it were, fallen off the front of the canon of the New Testament as far as many Christians were concerned. Matthew, Mark, Luke, and John were used to support points you might get out of Paul, but their actual message had not been glimpsed, let alone integrated into the larger biblical theology in which they claimed to belong. This, I remember saying, was heavily ironic in a tradition (to which he and I both belonged) that prided itself on being “biblical.” As far as I could see, that word was being used, in an entire Christian tradition, to mean “Pauline.” And even there I had questioned whether Paul was really being allowed to speak (p. 9). I have found that this dynamic pervades evangelical theology and culture. I remember hearing a major evangelical preacher say precisely this—that there was no reason for Jesus to live an entire life except that he needed to earn a store of righteousness that could be imputed to believers. John Piper’s recent address, “Did Jesus Preach the Gospel of Evangelicalism,” is another example of how the Gospels aren’t so much ignored as not taken seriously on their own terms. We use the gospels. We read them aloud in worship. We often preach from them. But have we even begun to hear what they are saying, the whole message, which is so much greater than the sum of the small parts with which we are, on one level, so familiar? I don’t think so. This is the lifetime puzzle. It isn’t just that we’ve all misread the gospels, though I think that’s broadly true. It is more that we haven’t really read them at all. We have fitted them into the framework of ideas and beliefs that we have acquired from other sources. I want in this book to allow them, as far as I can, to speak for themselves. Not everyone will like the result (p. 10). I think there are some reasons for this and I’ll discuss those in subsequent posts. For now, though, do you think Wright is onto something here? Tim, I have long been thinking that many read Paul into the Four Gospels. Indeed, many read Paul into the Old Testament. But if we read the Bible on its own terms, then we would find such an approach odd. But it is really hard to change that way of reading, for the current is really strong. The current is strong, indeed! And human pride reinforces certain ways of reading, unfortunately. We’re slow to change and we don’t want to be wrong. But reading Paul (or, a certain reading of Paul) into the Gospels certainly dominates the West. The “Word made Flesh” should be a our filter/hermeneutic for reading the rest of the Scriptures. Shouldn’t we read the incarnation of God revealed in the Gospels into Paul? It seems to me that at the very least we ought to read Paul as counseling churches how to correct problems that arise from trying to embody the Gospels in ‘live’ church situations. Our guest preacher yesterday told us that the only reason Jesus “had to become a human” was in order to “take the punishment for our sins.” Presumably, he otherwise could have remained a “spiritual being up in heaven.” Goodness! This kind of thinking makes no sense of the Gospels (nor of Colossians 1, for that matter). Tim, indeed it is “certain reading of Paul” that is being read into the Gospels. Upon Three Pillars, Jesus’ Spiritual Life: His Historical and Religious Setting. I think you would have loved it, Tim. Sounds interesting, Margaret — you have a link to the talk or to where there’s more about him? That’s a swipe at Wright, I would guess. It may be, but it’s worth noting that Piper did his doctorate in Germany on a historical-critical study of the Gospels, so he’s well aware of critical reconstructions of Jesus and the early Christian movement. The creeds are historically contingent documents, and I find it odd that we are looking back and chastising them for not meeting our historically contingent situation. Besides, are there other ways in which the church historically has appropriated the life of Jesus into it’s worship (hint: the answer is yes)? It’s not that the creeds didn’t anticipate and speak to our situation(s). They addressed their controversies, as Wright notes in his discussion. As valuable as the creeds are (it’s a ridiculous and insulting understatement to even write that! ), we are at fault for imagining that they must determine our readings of Scripture–or, that they determine for our day what is and isn’t important in Scripture. Yes, you’re surely correct! I just think Wright helpfully addresses a perennial problem for Christian communities–the tendency to impose on Scripture what it should and shouldn’t be saying. I’m with you on not reading our creeds back into Scripture. I just don’t want to critique the creeds for not including, “We believe that Jesus did a bunch of miracles and other good stuff.” The creeds were formed in controversy and then incorporated into the worship of the church, but as a part of the entirety of the churches worship. The development of the church calendar (for example) speaks volumes to how the church has historically appropriated the life of Jesus into it’s worship. The creeds don’t say those things because they weren’t meant to and they didn’t have to because it was expressed elsewhere in other ways. This is my little soap box. I know it’s not Wright’s whole point, but sometimes rhetorical tropes take on a life of their own and I don’t want people to forget that for much of Christian history the teachings of the church were connected with its worship, which was itself (whether people appropriated it or not) designed around the whole life of Christ–including all that stuff in between. I think Tom Wright has a fair point, but it is also important to note that in all of Acts the Apostles move from the Law, the Psalms and the Prophets to Jesus’ death and resurrection. They likewise hardly mention Jesus’ life in between. Very true, but I do wonder if the ends to which Jesus’ death & resurrection are cited are different. It seems that in Acts, these events signal that Jesus is the one whose teachings should be heeded, the one in and through whom Israel’s God is bringing his Kingdom program to a climax and fulfillment. So, the death and resurrection of Jesus in the apostles’ preaching point back to Jesus’ life and teaching. Evangelical Christians, for example, have an “atonement” theology that captures the transaction whereby people are reconciled to God (or, one version of it), and their understanding of Jesus begins and ends with whatever is relevant to informing that transaction.